Enjoy Staying at San Francisco Hotel's Ideal Location Holiday Inn San Francisco-Golden Gateway is a full-service conference hotel in downtown San Francisco centered between Nob Hill, Fisherman's Wharf, the Golden Gate Bridge and Pacific Heights, an oasis for corporate and leisure travelers offering the "True San Francisco Experience. "Rising 26 stories with 496 guestrooms starting on the 6th floor, each offers outstanding city or bay views.On-site heated outdoor pool, 24-hour business center and fitness center, guest laundry, dry-cleaning services, R-O-H Bar and Restaurant including room service starting at 5pm. Over 100 restaurants within walking distance as well.Historic cable cars just steps from the hotel, providing easy access to Fisherman's Wharf, Union Square, Financial District and Chinatown. Attractions minutes from the hotel include Golden Gate Bridge, Alcatraz, beautiful Golden Gate Park, Moscone Convention Center and Yerba Buena Gardens. Depending on the season, you can also plan to take in a 49ers or Giants game at AT&T park. Our conference hotel features more than 18,000 sq ft of flexible meeting space including our two Ballrooms. We can accommodate groups and meetings from 10 to 450 people for business or social events. On-site audio/visual and conference services are available. 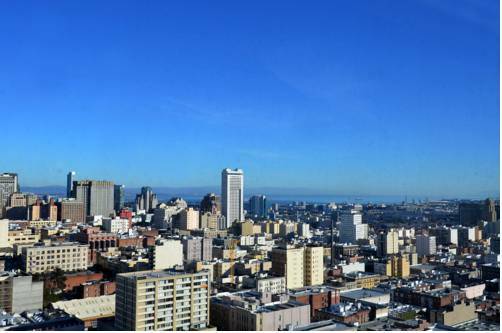 Holiday Inn San Francisco-Golden Gateway looks forward to see you on your next visit to San Francisco! R.O.H: R.O.H serves breakfast and dinner and offers a variety of international craft beers and supreme wines from Napa and Sonoma Valleys. R O H: Lounge at our full service bar on-site for a large selection of wines and cocktails. Childrens's program - 6th Floor outdoor heated pool with city view. Emerald Ballroom: The Emerald Ballroom is a total of 5600 sq feet and can be divided into 2 smaller rooms, the Emerald Room at 3350 sq feet and the Crystal Room at 2250 sq feet. Hotel has a full service audio viusal company to handle any rental of AV equipment..
Gold Rush Ballroom: 5400 Square Foot Meeing Space . Divided into two rooms. No pillars in the rooms and great lighting. Redwood Room: No adjoining conference rooms attached. Very quiet and secure. Pacific Suites: Pacific Suites can be divided into (4) separate rooms. Ideal for breakout space. Each room is about 682 SqFt and has a vanity/counter space to layout event materials or food/beverage. Portola: Located on the main lobby level of hotel. Great room for receptions and exhibits. High traffic flow. Executive Conference Room: Great speaker ready room, office, or conference room. Located just outside the Emerald Ballroom, lobby level. Monterey/Carmel: Conference room or office/registration on main conference level. Presidio Golf CourseThe Presidio golf course opened for public play in 1995 and has beome one of the nation's top public courses. This 18-hole course plays 6,500 yards of challenging golf winding through Eucalyptus and Monterey Pine trees in The City's trademark hills. Pier 39/Fisherman's Wharf/Alcatraz - NorthSan Francisco's most popular tourist attraction with food, shopping and plenty of photo opportunties. Catch a ride to Alcatraz, have lunch at the Wharf and shop till you drop at Pier 39. Union Square/Chinatown/Financial Center - EastUpscale shopping at Union Square and the San Francisco Shopping to the very discounted Chinatown district on Grant Street. Moscone Convention Center - South EastConvention Center located just 7 minutes by taxi or 20 minute walk. California Cable Car lineWorld Famous Cable Car Line. The California line picks up right next to the hotel. Tickets for purchase through hotel concierge or directly from trolley attendant. Coit Tower - North EastOverlooking the San Francisco Skyline Coit Tower is a must see attraction. In addition to the great views are the wonderful murals decorating the lobby. Presidio - North WestA former military based turned public park. There are 11 miles of hiking trails, including the Golden Gate Promenade, the Coastal Trail, an ecology trail and portions of the Bay. Golden Gate Park - WestWorld famous Golden Gate Park. Haight/Ashbury - WestThe Haight today is home to boutiques, vintage-clothing shops, second hand stores, internet cafes and hip restuarants. Be sure to check out the Grateful Dead House and the Flower Power walking tours.